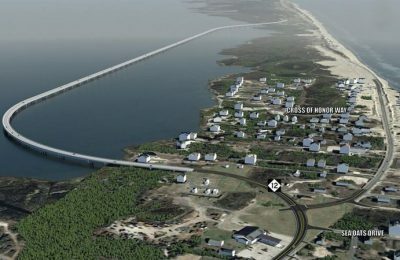 A federal appeals court has dismissed continued efforts by Hatteras Island property owners and residents to halt construction of the “jug-handle” bridge over the Pamlico Sound. In a decision published Wednesday, the U.S. Fourth Circuit Court of Appeals affirmed a lower court’s dismissal of claims that the North Carolina Department of Transportation and the Federal Highway Administration violated the National Environmental Policy Act and the Department of Transportation Act in approving the 2.4-mile-long bridge over the sound to bypass northern Rodanthe. Save Our Sound OBX Inc. and six individual plaintiffs brought the original action in February 2017 in U.S District Court for the Eastern District of North Carolina against the NCDOT and the highway administration. The group said that instead of basing their choice on an objective analysis of the environmental impacts of the various alternatives, as required by state and federal law, officials unlawfully predetermined their selection of the “jug-handle” bridge pursuant to a backroom deal struck with the Southern Environmental Law Center as part of a settlement from previous lawsuits related to the replacement of the Bonner Bridge over Oregon Inlet. The “jug-handle” bridge construction is part of the second phase of the Bonner bridge replacement project. In June 2018, U.S. District Court Judge Louise Flanagan issued a 46-page ruling that dismissed the claims. Save Our Sound OBX appealed the decision to the Fourth Circuit Court of Appeals, which considered the case and issued its decision Jan. 23.